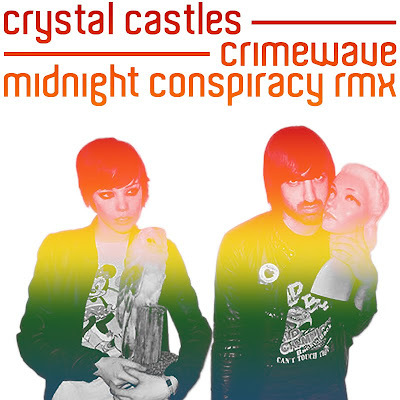 Toronto electro-thrash band Crystal Castles have returned! Marking their comeback, they have a lot in the works for this Spring/Summer, including a new single to be released April 17th titled 'Doe Deer', a new album coming possibly by June and a summer N. American tour! To tantalize your taste buds for all this, they have released an amazing new remix of their earlier track 'Crimewave' courtesy of Chicago Italo-disco artists Midnight Conspiracy. You might recognize them from the great remix they did of Chromeo's 'Night by Night' Ray posted about here back in February. They've cranked up the synth and have taken Crystal Castle's already great track to the next level of dancebility, sure to have many scene DJs getting their dance floors throbbing!